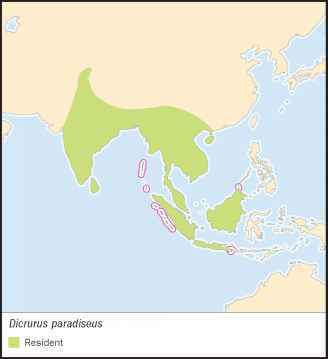 Cuculusparadiseus Linnaeus, 1766, "Siam" = region between Ayuthia and Gulf of Thailand. 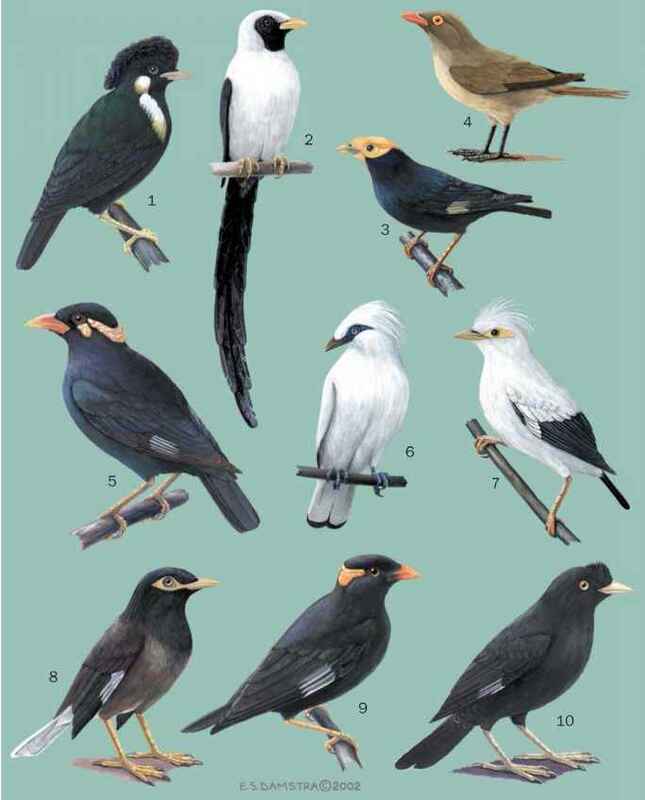 About 14 subspecies, differing principally in size and presence and form of crest and tail rackets. English: Large racket-tailed drongo; French: Drongo a raquettes; German: Flaggendrongo; Spanish: Drogo de Cola Raqueta Grande. 13-14 in (33-36 cm), excluding rackets; 2.5-4.4 oz (70-125 g). Most extravagantly plumed drongo, red-eyed and all black glossed bluish to greenish, with scaly-hackled mantle, a large crest varying from forward-facing bristles to, usually, webbed plumes curving back over crown in a mane, and an extraordinary tail with two outer racket-tipped streamers that, of variable form, are often bare of webbing except for short, twisted spoon-shaped vanes at tips; sexes similar but immatures dull and brown-eyed with vestigial crests and shortened tail streamers. Lowland Southeast Asia, locally to 4,900 ft (1,500 m) above sea level, from India and Sri Lanka north to south Himalayas, and east to all Southeast Asia south of south China (Yunnan, Hainan Island) and north Vietnam, and throughout Greater Sundas and archipelagos in the Bay of Bengal. Open interior and edges of evergreen and deciduous forests, including rainforests, and taller close woodlands, from sea-level to 4,900 ft (1,500 m); also plantations, garden edges, and open secondary growth. Either solitary, in pairs or small family groups, greater racket-tailed drongos are resident and territorial throughout their range. They commonly associate with foraging bands of mixed bird species, perching on exposed branches in and on the edge of forest mid-strata and sallying forth on wing. Flight is buoyant and dipping, of rapid flapping then gliding, the tail streamers making a distinctive humming. Racket-tails are extrovertly noisy, often displaying and counter-singing in small groups, and are one of the first and last birds stirring at dawn and dusk. They have a lusty repertoire of resonant warbles, whistles, and bell-like notes, mixed with typically drongo-like dry chatterings and metallic twanging; mimicry is also a feature. Hawks, like other drongos, catching prey in mid-air or from vegetation surfaces and often carrying it in its claws to a perch for dismembering. Diet comprises mainly a range of large flying insects (termites, moths, beetles, dragonflies, ants, bees, locusts, and mantids); nectar is an important supplement. Breeds over summer (June-July) in northern parts of range, but earlier from winter (February) in the low tropics. Nest a deep, loose cup, 5.9 in diameter x 1.9 in deep (15 cm x 5 cm), of twigs, bark, and tendrils, unlined and with little, if any, binding cobweb, fastened at the rim into a horizontal fork at a branch end, 16-50 ft (5-15 m) above the ground. Eggs, in clutches of 2-4, are 1-1.1 in x 0.7-0.8 in (26-29 mm x 19-21 mm) and creamy white to pale pink, blotched and speckled with deep red-brown and underlying pink-grays. Although the species as a whole is not threatened, some of its races on small islands are vulnerable to habitat depletion, notably D. p. banguey, D. p. microlophus, D. p. lophorinus, D. p. otio-sus, D. p. nicobariensis, and possibly D. p. johni.